NeoAxis Group announces a new 3D development environment NeoAxis Engine version 2019.1. The environment can be used to develop all kinds of 3D projects such as computer games, visual trainers, VR systems, to visualize processes and develop windowed applications. The engine uses OpenGL API for rendering. 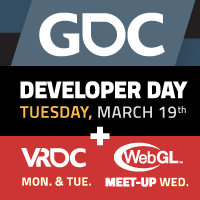 If you are attending GDC 2019, be sure to mark March 19th in your calendar. Khronos will be hosting the annual Developer Day sessions in the Moscone West, Room 2020 from 10am to 6:30PM. This year there will be six (6) sessions covering glTF, WebGL, OpenXR, Vulkan and OpenGL ES. There will also be an OpenXR table at VRDC where you can learn more about OpenXR, talk with OpenXR working group members, and learn how your company can implement or join in the development of this important industry standard. The Khronos Group is once again sponsoring the WebGL/WebVR Meetup. Last year we had over 200 RSVPs and an amazing lineup of speakers. Khronos has formed a liaison agreement with the Open Geospatial Consortium (OGC) in the interest of jointly advancing open geospatial standards related to AR and VR, distributed simulation, and 3D content services. The liaison will let Khronos and OGC assess standards in these fields as well as identify future potential standards that will facilitate interoperability and hardware capabilities of relevant data sharing and analysis. The collaboration will occur through working groups, forums, workshops, committee activities, etc., and OGC will adopt Khronos standards where appropriate. During the two weeks of October 17-26, Neil Trevett, president of the Khronos Group, will visit a few cities in China to speak at local conventions, universities and member companies. Khronos is looking forward to meeting with local Khronos members, academias and the developer community, to share the latest updates about Khronos APIs. A complete list of public talks at conferences and free public sessions & registration is now online.